Amun-Re was the new offering from Reiner Knizia in 2003. Although many people were unfamiliar with the game prior to WBC, 85 players turned out to play in one of the two qualifying heats. 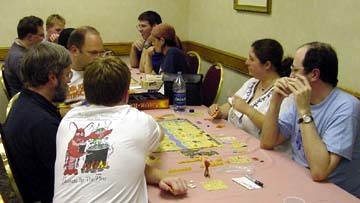 Amun-Re plays well as a four- or five-player game and both versions were used in the qualifying heats. Amun-Re looks a lot like Ra, but is much more complex and requires long term strategy to win. There were various questions concerning rules interpretations during the heats, but most were resolved rather amicably. One matter had to be adjudicated by the GM. A total of 20 people qualified for the semi-finals including two players, Brian Jones and Rich Meyer, who had won both of their preliminary games. Rich also set the highest single score of the tournament with 51 points. Four people advanced to the final. Richard Meyer, Ilan Woll, Arthur Field and Luke Koleszar all qualified. The final was played with considerable repartee. It turned out Richard and Arthur were best friends in high school and had not seen each other for over ten years. That didn't stop either of them from needling the other. Luke played his usual quiet but intense game. At the end of the first round, Luke was ahead of Arthur by two points. Richard was one behind Arthur and Ilan was five behind Luke. Things looked good for Luke. In round 2, Arthur made a critical move by buying the largest existing pyramid on a camel province and capturing the two-temple space at Damanhur. The combination assured him of income each time. Unlike the other players, Arthur confined his power card purchases to one card almost every turn. Ilan bought three cards on most turns. Richard and Luke generally bought two. Richard and Ilan got in a bidding war for the large pyramid on Thebes, which had the extra two power cards as a bonus. Ilan, in a clear lapse of concentration, overbid and essentially took himself out of the rest of the game. Things looked good for Richard. Arthur, however, kept his head down and stayed beneath the radar. When the smoke cleared on the final scoring round, Arthur edged out Richard and Luke by less than three points. Ilan trailed farther back. Arthur attributed his win to following a balanced purchasing plan similar to his Princes of Florence strategy. He was also lucky enough to get the right bonus power card and purchase the correct provinces. He said he really enjoyed beating Richard after all those years of losing games to him. He also felt it was an honor to have beaten such fine gamers, especially Luke. All four players had a fine time in the finals and appeared to understand the strategy of the new game quite well. None of them had played Amun-Re more than three times prior to coming to WBC. This is a testament to the excellence of the game itself and the fine skills of the finalists.